For anyone looking for excellent levels of performance from a ‘hot’ estate then look no further than the excellent Seat Leon ST Cupra 280. This high-performance car offers class leading performance from a 2.0litre turbocharged engine producing 280PS which will help propel the vehicle from 0 to 62 mph in just six seconds. Its top speed has been limited to 155 mph. While the car has no direct competitor in its segment, it offers more equivalent power than any other high performance estate. If there was a direct rival, it’s likely to be the Ford Focus ST-3 though the Seat comes with more power and more kit. In addition, the estate will be a workhorse for those needing it for work purposes and an excellent performer on the school run; it’s a very comfortable car to drive especially on long journeys. There’s a decent sized boot, it’s 587litres in size and with the rear seats folded down that will rise to 1,470litres. To help the car stand out from the crowd, the Spanish carmaker has fitted red brake callipers, a rear diffuser and spoiler, two chrome tailpipes and large air intakes at the front. There’s a lots of kit on board, plenty of luxury touches and a good list of gadgets to help make driving more enjoyable and a tad easier and which also help to pitch the Cupra 280 as a sports car. For instance, there is the ability to easily change the car’s steering, suspension and throttle set-up to suit the road conditions, or the driver’s mood. Seat have also fitted a leather steering wheel, Alcantara sports seats along with automatic wipers and lights. There’s also the firm’s ‘media system plus’ which consists of satnav and DAB radio. The options list is also quite extensive which includes a ‘colour-line pack’ which sees the choice of orange, black or white stripes being painted on the car to ensure it gets even more attention. Buyers can also option better brakes, bigger alloy wheels and body coloured side skirts. 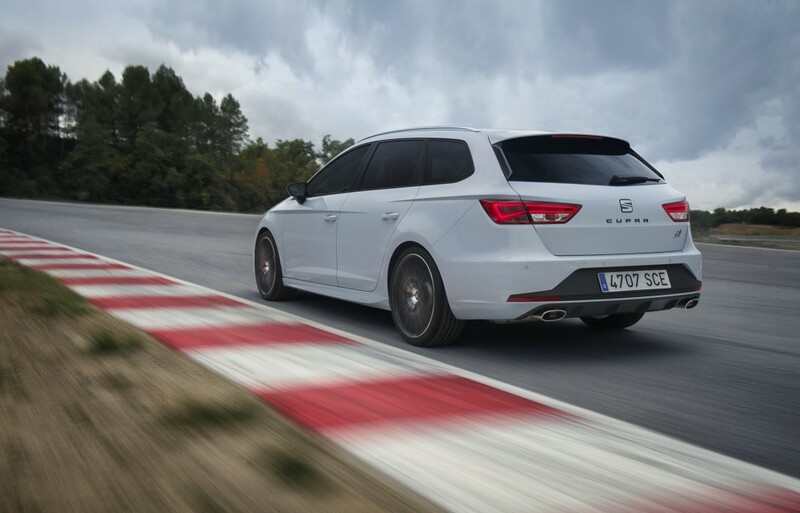 The Seat Leon ST Cupra 280 will make its debut in February 2015 with prices starting at £28,500 for the manual gearbox version and £29,860 for the automatic models. It’s available to order now and will be in the Seat showrooms from March. This entry was posted in Car Leasing, Car Updates & Releases, Cars, Family Car, Performance Car and tagged lease a Seat Leon Cupra, SEAT Cupra 280, SEAT Leon Cupra, Seat Leon ST Cupra 280 by Steve Lumley. Bookmark the permalink.